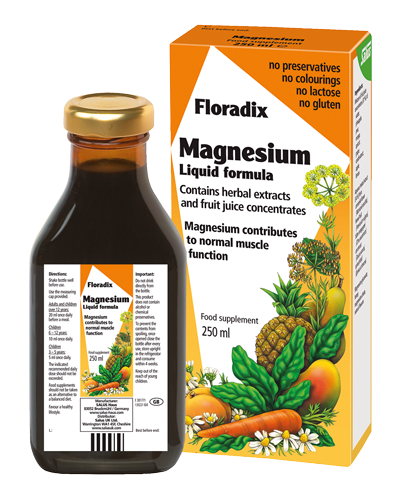 Floradix Magnesium contains several fruit juice concentrates and selected herbs for a pleasant taste. Floradix Magnesium contains no alcohol, preservatives, colourings or artificial flavourings. It is gluten free, lactose free and suitable for vegetarians. Floradix Magnesium is particularly beneficial for sportsmen and -women, physically hard working people and for those who sweat profusely. Children 6–12 years of age: 10ml once daily. Children 3–5 years of age: 5ml once daily. Mixture of fruit juice concentrates (37 %) of: water, pineapple, pear, mango, apricot, carob extract, grape, apple, lemon. Aqueous herbal extract (34 %) from: camomile flower (Matricaria recutita), fennel fruit (Foeniculum vulgare), bitter orange peel (Citrus aurantium), carrot root (Daucus carota), spinach leaf (Spinacia oleracea). Magnesium gluconate, honey, magnesium citrate, natural flavours.